This peanut butter dog treat recipe calls for peanut butter powder. But you can use natural unsweetened peanut butter in its place. These all natural dog treats with added banana will make any dog howl like a hound dog....for more. These peanut butter dog treats made by LazyBones Pet Treats are made with banana and decorated with Fido's Frosting brand Royal Icing for Dogs, which gives them a shiny finish. This yogurt dog treat icing recipe dries hard and will not melt. In mixing bowl, combine package of dog biscuit mix with water, oil, peanut butter powder, mashed banana. Mix well to form a dough. If the mix is too dry for rolling, add a little more water. Cover the work area with waxed paper that has been lightly moistened with water underneath to keep it from slipping. Lightly flour the waxed paper. Spoon dough out into a ball on the lightly floured surface. Lightly flour the rolling pin and roll the dough ball into a flat rectangle 1/2 inch thick. Take lightly floured dog cookie cutters and press into the dough to make decorative shapes. Place dough cut-outs on pre-greased cookie sheet. Turn off oven heat and leave tray in over 60 minutes more. 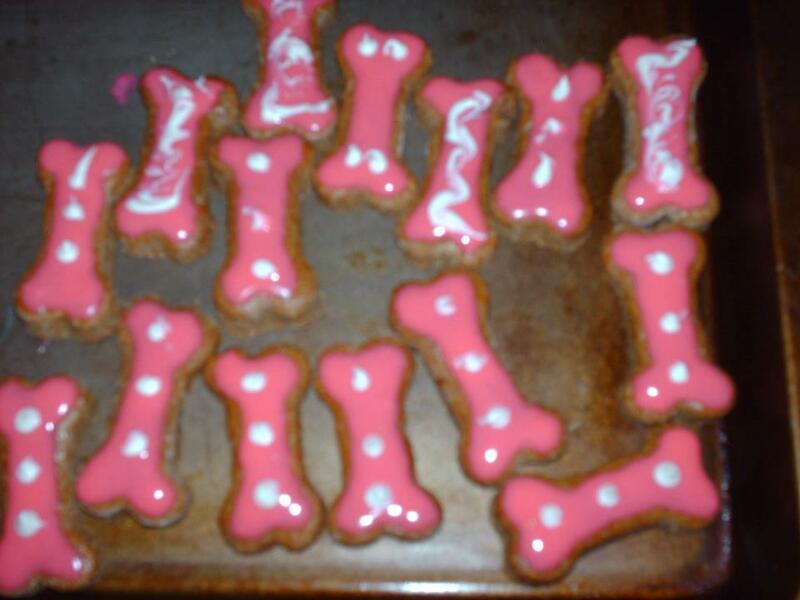 When the dog biscuits are completely cooled, decorate with dog treat icing as in the image above for a festive finish. Let them dry overnight. It can be washed in the dishwasher and does not require pre-greasing with the biscuit mix.